I’m a farmer, and I’m a mom. And while most of my mom friends aren’t farmers, they all have a lot to do with food – like putting it on the table for their families. And that’s where their questions about farming usually come from. They want to know that what they are feeding their families is safe and healthy. Don’t we all? The most common questions my mom friends ask me are about understanding pesticides, and how and why farmers use them. The problem with pesticides is that they can look and sound scary to people who aren’t involved in farming or agriculture. I’ll do my best to address some of the most common misperceptions about pesticides here. I was reminded of the disconnect between farmers and consumers at my daughter’s soccer game this summer. 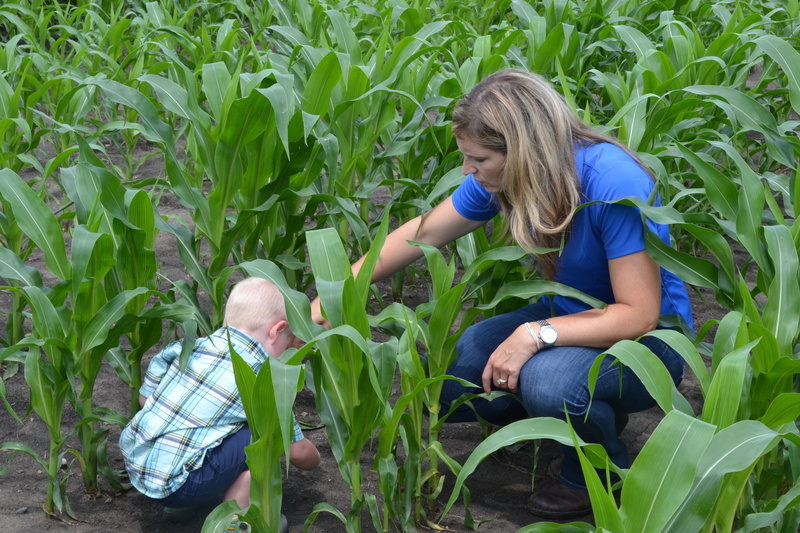 One of the moms said she saw a farmer spraying a soybean field and she couldn’t believe the amount of chemicals he was spraying on his crops – and her food. As we talked, I realized she thought everything coming out of the sprayer was a pesticide. She was surprised to learn that the vast majority of it was water. Let me explain. I’ll use glyphosate (the exact same chemical that’s in the bottle labeled “Roundup” at the hardware store) as an example since it’s a pesticide that gets a lot of attention these days. If a farmer chooses to use glyphosate to control weeds, he or she will spray about 15 gallons of liquid to provide weed control on an acre of land (about the size of a football field). But only about 22 ounces of that is glyphosate (about the size of a medium soda). The rest is water. Glyphosate for weed control is one example of a pesticide a farmer might use on his or her farm. Pesticides can also include things like insecticides to control insect pests and fungicides to control plant diseases. Just as gardeners deal with weeds, insects and diseases that can wreak havoc on their fruits and vegetables, farmers also manage for a variety of pests that interfere with their crops. Farmers only use pesticides when necessary. When it comes to pesticides, farmers are focused on continuous improvement and doing more with less. We use pesticides only when we need to and within the strict rules established by the Environmental Protection Agency. We are constantly walking our fields to look for things like insects, diseases or weeds that could harm the quality and the yields of our crops. We use that information, along with years of experience and other farmers, agronomists and university experts to help determine how and when a pesticide might be needed on our farm. Friends have also told me that they choose to buy organic to avoid pesticides. Many are surprised to learn that there are more than 45 synthetic pesticides allowed in organic farming. Organic does not equal pesticide-free. I tell my friends that whether they choose to buy conventional or organic foods, they can take comfort knowing the levels of pesticide residues are very low – far below that which USDA and EPA have deemed to be safe for human consumption. Pesticides are a complex topic. There is way more it than I can address in a single post. If you have questions about pesticides or other topics related to food and farming, CommonGround is here to help. At CommonGround, we are a group of farm women who volunteer our time to help answer your questions. While we may not individually have all the answers for every topic, we’ll work to connect you with someone who does. You can find us at www.findourcommonground.com or on Facebook at www.facebook.com/commongroundnow. Thank you for trying to educate people on how their food is grown and taken care of. Thanks and keep telling the truth. That will be the only way to get past the many loud anti-pesticide folks. Sometimes I remind a mom that without pesticides. Head lice would be really common. I was a custom applicator of pesticides for 42 years. I sprayed Agent Orange (2,4,5-T & 2,4-D), Furadan, Paraquat, and many other pesticides. At 70 years old, I’m living proof that pesticides are not as dangerous as the media claims they are. I was young and reckless & didn’t wear the protective that is required today. The danger of pesticides is much less than the pain of hunger that will happen if pesticides are prohibited. Can answer a lot of question . Retired citrus and tree fruit grower, veggies too. Thank you for your clarification! We have a very large garden and we know a lot about organic. It is just higher prices on produce to make money. I have tried to tell our neighbors and families that they are wasting their money on buying organic. Thanks from a Montana farmer/rancher/science teacher! Many people are willing to jump on the bandwagon without understanding where it’s been or where it’s going! I appreciate you. Glyphosate has been demonstrated to be dangerous on various levels. Many western countries have indeed banned it for those reasons. There is more recent literature coming out that shows glyphosate disrupts certain receptors in your body which ends up inhibiting the bodies ability to excrete toxins, one of those being the glyphosate you just ingested. Large scale organic producers certainly do use methods that would surprise many foodies. However, the small scale producers are typically very vigilant and careful to only use any kind of intervention that could be considered detrimental. Glyphosate indeed is for weed control which makes it a herbicide. Not sure why all chemical application in the article is lumped into one category of pesticides. Great article Julie!! Thank you for posting!